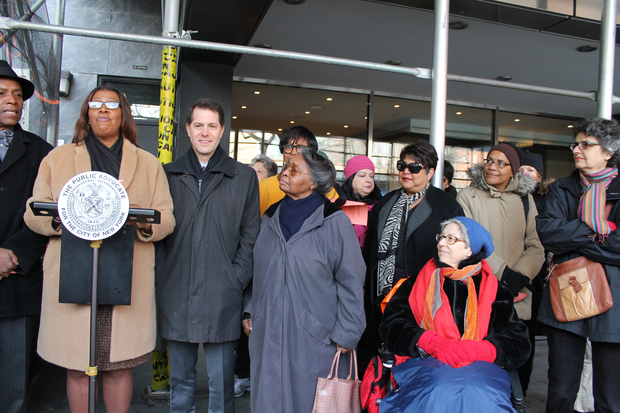 UPPER WEST SIDE — A building management company that's barring its rent-regulated tenants from using a new gym will be hit with a discrimination complaint filed by the city, Public Advocate Letitia James said. The suit comes as politicians likened Stonehenge Village's attempt to ban rent-regulated tenants, who make up 60 percent of the occupants at West 97th St. building, with apartheid. Residents were told earlier this month that a new lobby-level gym would only be accessible to market-rate tenants. Dozens of furious tenants gathered alongside James and other elected officials Tuesday to condemn the policy. "We will not accept segregation in New York City," she said. State Sen. Bill Perkins called the company's decision a "form of apartheid." Many of the rent-regulated tenants were part of the city's Mitchell-Lama affordable housing plan and "came [to the building] at a time when the real estate community had forsaken this area," said City Councilman Mark Levine, who joined the chorus of complaints. Referencing a sign that residents said has since been taken down from the door of the gym — which told "approved" residents not to hold the door for anyone — Levine said the message "recalls memories of the pre-Civil Rights era." "We're one city. We're one building," added Manhattan Borough President Gale Brewer. Residents spoke of the embarrassment they felt at not being able to use the new gym. "I have to tell a child that I'm not good enough," said resident Treda Palmer Saxton of her experience walking through the lobby with her 7-year-old goddaughter, who wanted to use the facility. "Our management is short-sighted and greedy," added tenant association president Jean Dorsey, who said the market-rate tenants she'd spoken to were happy to share. The New York State Human Rights Division declined to comment.